It is a well- known fact that Dr John H F Smith was instrumental in setting up the former Sheffield Cytology Training Centre. The British Association for Cytopathology (BAC) was formed in 2011 by the merger of two previous societies, the BSCC (British Society for Clinical Cytology) and the NAC (National Association of Cytologists). 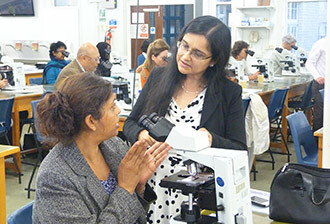 The BAC represents cytology in all its forms within the UK, and works closely with other relevant societies, national bodies and government departments. The BAC exists to promote the discipline of Cytopathology and, as a non-profit making organisation, any surplus money goes back into the Association to serve you as a member. One such opportunity is the Bursary scheme for Continuing Education. The BAC is able to provide financial assistance for members to attend cytology events where attendance would otherwise not be possible. Funding is available to support registration fees and /or travel expenses for BAC members of over one year's standing with the society.